Founding Franklin | Book Review: Benjamin Franklin in London: The British Life of America’s Founding Father, by George Goodwin. There have been many books written about Benjamin Franklin in the past fifteen years or so, many of them quite well done. I have my favorites, among them The Americanization of Benjamin Franklin, by Gordon Wood; The First American, by H.W. Brands; A Great Improvisation, by Stacy Schiff, and a number of others. This new work, by George Goodwin, official historian of the Benjamin Franklin House in London, is one of the best I have seen. 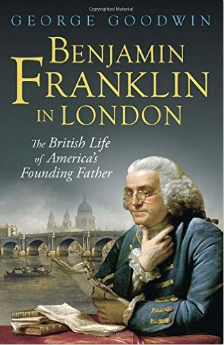 Goodwin gives the most thorough account of Franklin’s activity during his three visits to London that I have read. He talks at great length about the people that Franklin met and worked with in London, and those that refused to work with him. There is much here about Peter Collinson, for example, the English Quaker scientist and naturalist, who contributed greatly to Franklin’s interest and work in the field of electricity. ( I will use the word “scientist” for the sake of clarity, though the term used at the time was “natural philosopher”.) There are others, including Dr. John Pringle, John Fothergill, Adam Smith and David Hume, with whom Franklin worked and socialized, as well as John Bartram. Bartram, Franklin’s old friend back in Upper Darby, Pa., was the foremost American naturalist, and according to Linnaeus, perhaps the greatest in the world. Franklin corresponded with Bartram regularly, sending him word of various discoveries, such as rhubarb and tofu. Franklin even sent rhubarb to Bartram, and also the seeds and the recipe for tofu, introducing them to America. Having said all this about the thoroughness of the work, I hasten to point out that this is not an academic tome. It is a clearly written, accessible work, that I recommend to any interested reader. I think you will find it quite enjoyable.